There’s a sperm whale under his white board and someone wants a narwhal downstairs. All they have for sale is a octopus. I dropped by Fine Balance Imaging, officially to talk about business, unofficially because they are fun folks to visit. A lot has been happening with the shop. New metal prints, fabric prints that cover the entire cloth, even bracelets. They also do decals, and that’s where the narwhal comes in. 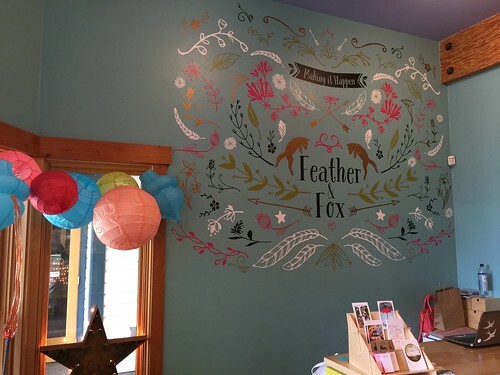 Rhiannon, the owner of Feather & Fox, had a creative flash. She designed a piece of wall art that is measured 7 feet on a side, but doesn’t require massive sheets of paper. It’s a collection of about a hundred vinyl decals arrayed across the wall, meticulously placed, but never weighing much, and infinitely variable. Impressive. Then, a customer came in. They liked it, and something in it inspired them to ask for a decal of a narwhal. Isn’t creativity fun? Joe told the story, and then pointed out that he can do that, but he’s already cut a whale ( it’s under his whiteboard). “I popped downstairs to the shop to ask Rhiannon something, and a couple customers came in. A gal and her kid and I think probably a brother/friend/something with her. She picks up the small narwhal decal, brother grabs it, meanwhile the kid is delighted. We start chatting and I show them the octopus t-shirt I just designed which was the second all-over-printed shirt we did as soon as we got the new tech. Everyone suddenly is debating whether narwhals are even real, and I pull up images on the iPad showing they are indeed the unicorns of the sea (including the one with the unicorn hiding inside the narwhal body, which would also make a great shirt). 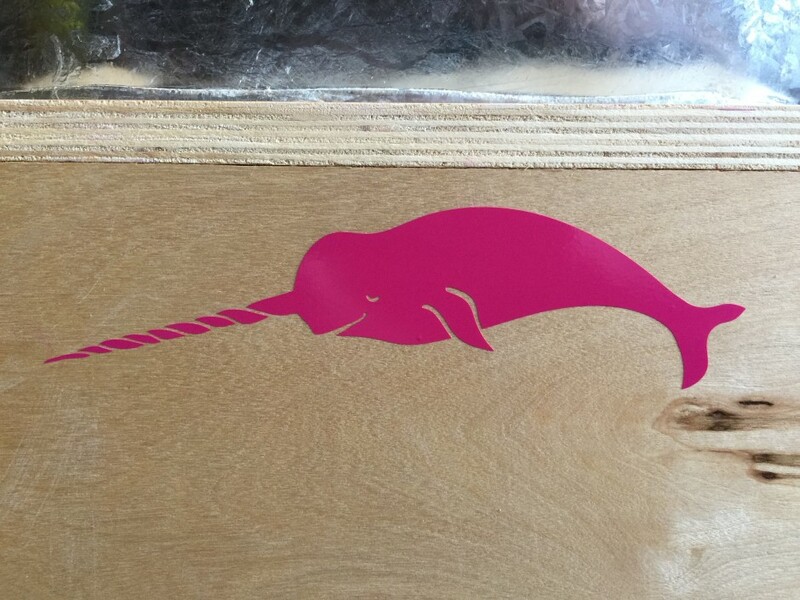 Now they’re definitely excited, so I mention that if they really like the narwhal decal, we can do it in any color or size (if they don’t like the hot pink version now in the kid’s hands…but they did, because the guy is wearing pink shorts). I point to the giant wall design we just completed – designed by Rhiannon, mostly installed by me since it goes all the way up to the ten foot ceiling across a nine foot wall. They meekly ask if there’s any way we could make a narwhal in the copper or green and bigger like the fox on the wall…and how many days it might take. I say, I’ll do it right now. They say in disbelief, ‘so we can come get it in a couple hours?’ and I say, ‘Gimme fifteen minutes’ and they say they’ll come back later…I wonder if I’m wasting my time or if they’ll actually come back. Five minutes later I’m back downstairs wondering if they meant twelve inches from end of the horn to the tail or just the narwhal body, but they are still there paying for something else and are flabbergasted (yes, it’s a word) that I now have in my hands two 12-inch narwhal decals. As we joked about a whale on a wall, the screen showed another new product: the ability to totally cover a shirt with a print produced a shirt with an octopus wrapped around the shirt, and around the wearer. Sure, we live on an island and sea life is natural, so the imagery is to be expected. The fun part was seeing how far printing has come. It isn’t just paper, matted and framed. It is now on shirts, walls, and – what’s next? How about a …?